As Florida’s lead kept ballooning larger and larger, it felt too good to be true. 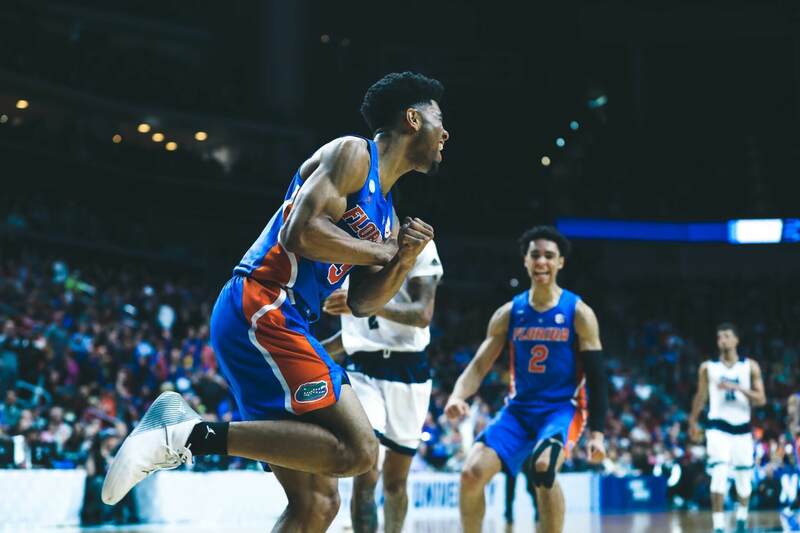 Jalen Hudson paced Florida with three early threes, Kevarrius Hayes turned in a workmanlike sixteen points, and the Gators survived their first round NCAA Tournament game against Nevada despite blowing an eighteen point lead, winning 70-61. The win is Florida’s first ever as a double digit seed in the Big Dance, and puts the Gators back in the Round of 32 for the third consecutive year. Credit Hayes for making all those stats factually correct, and to a slightly lesser extent, big man coach Al Pinkins. The senior center scrapped and clawed down low for the majority of the forty minutes. He also came through from the free throw line, hitting six of his eight foul shots- which is a significant improvement from the 66% clip he entered the night with. Five of those free throws came in the final 4:17 of game action, and helped the Gators put the Wolfpack away. It shouldn’t have come down to that, though. Relaxing in style with the cruise control on, Florida entered one of its patented cold stretches when Nevada applied a press and the offense stalled. As the Gators could only muster seven points through the next eleven minutes of game action, Nevada came roaring back on the backs of twins Cody and Caleb Martin. Using their suddenly aggressive defense to speed Florida’s offense up- and muck it up- the Wolfpack shaved the deficit all the way down to a single bucket, 63-61, with two minutes to go. Along the way, they coaxed Hayes into his fifth foul. Then the Gators did what the great teams do. They finished. After draining down the shot clock, Andrew Nembhard began a game-ending 7-0 run with a driving underhanded layup through the right side of the lane to make it 65-61. Caleb Martin clanged a three off the rim for the Wolfpack, and a few seconds later Keyontae Johnson found Dontay Bassett for a rim-rattling dunk. Jordan Caroline then bricked a three, Nembhard secured the rebound, and from there it just a matter of making free throws. Which Florida did. And so they survived. The Gators would be better served in their next game against Michigan if they clean a lot of things up. For starters, Florida is dead right off the bat if they go cold from the floor again like they did in the middle of the second half today. Regardless of what defense John Beilein throws at them, Florida has to maintain its discipline offensively and ensure that it gets good shots. The Wolverines are the second highest ranked defensive team in terms of efficiency (.861 points allowed per possession), which is the definition of a bad matchup for the offensively challenged Gators, and Florida surely won’t help itself by forcing things the way they did late in the second half against Nevada. A similar issue: it seemed as though in that second half cold stretch yesterday, Florida was hoping that shots would fall rather than making them fall, something that White picked up on and critiqued the team for in the postgame press conference. Also, it wouldn’t kill this team to be a little quicker at detecting when a teammate is in trouble with the ball and then going over to help him out. But for all they did wrong- namely, blowing an 18 point lead in the second half and allowing Nevada to force them to panic when the Wolfpack dispatched their press- the 2018/19 Florida Gators have an NCAA Tournament win to their name, something that seemed far fetched as recently as two weeks ago. They’ve got it now, and kudos to each and every one of them for that. Who knows? Maybe one deserves another. You nailed it. I don’t think many of us saw Florida winning an NCAA Tourney game two weeks ago and they did. Gotta credit White for that.